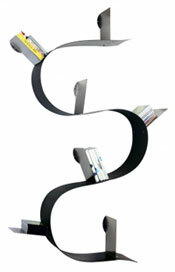 Originally designed in steel, this bestselling Bookworm shelving unit by Ron Arad for Kartell is now produced in a semi-translucent PVC. The current version is available in different sizes and colours – working as a CD, book or accessory shelf and can be shaped as you’d like. You can get a high street version, but the quality isn’t up to the designer version, which retails at £171. The budget Wave (pictured) is only available in black, made from regular plastic and lacks the glowing finish unique to the upmarket model. But the Wave is a third of the price at £69, so certainly worth considering.